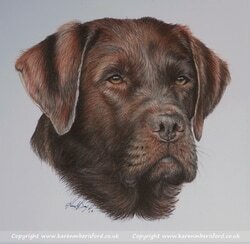 ​A beautiful portrait of a lovely Chocolate Labrador called Ernest. As you can see from the reference photograph I had to make a rather vast change to Ern's mouth as it looks as if he had just closed his mouth leaving it 'puffed' instead of natural and trying to change this without an actual reference is a very difficult thing to do as I was unable to tell if it still resembled Ern once complete. I also ensured the shiny areas on the face caused by the sun, was balanced out and the heavy shadows under the neck was also softened. This portrait was a real challenge but thoroughly enjoyed taking on the task. Thank you so much for all the hard work & effort put in to make the numerous photo's I bombarded you with, come to life! The portrait is just amazing, beautiful & captures Ern perfectly!